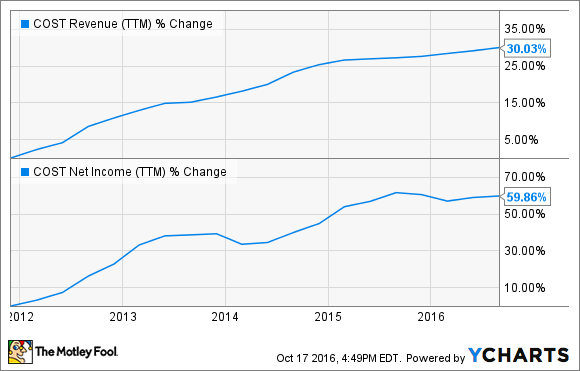 Are Shares of Costco Wholesale Corporation a Good Value? The company is facing a slowdown in overall sales and profitability. 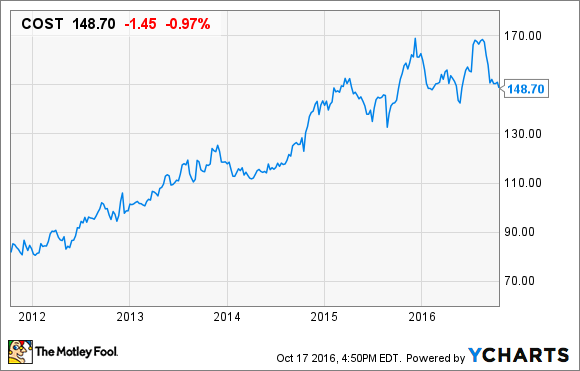 Is now a good time to buy the stock? Costco (NASDAQ:COST) shares are trading 10% off of the $170 highs reached a couple of months ago. At first glance at recent declines, the stock looks like a value. However, when looking at the fact that the wholesaler trades at 28 times the past 12 months' worth of profits and has struggled to boost sales, the stock doesn't look like such a good deal. Costco reported its full fiscal-year results at the end of September. It was a lackluster year, with revenue only 2.2% higher than last year and earnings per share down 0.7%. Comparable sales were flat when factoring lower fuel costs for Costco's gas business and a negative impact from foreign currency exchange rates from its international locations. Costco's stock has had a nice run the past five years -- up roughly 80% -- as the company has enjoyed top- and bottom-line growth. Shares have stalled out recently, though, as the company has struggled to push sales and profitability growth at the same rate as in years past. Part of the company's woes have been the onslaught of online retail. While Costco operates its own internet store, heavy competition from internet-only retailers and overall digital sales growth in the U.S. in the double digits for the last few years has taken its toll. Also contributing to the slowdown is a more sluggish rate in new locations over the past few years. The company ended August with a total of 715 warehouse stores worldwide and expects to open another eight by year's end. That would amount to about 3.5% more locations than last year, but it's a slower new opening rate than in the past. The company is making boosting sales at existing locations a bigger part of the strategy as time goes on by attempting to increase foot traffic and the average checkout total per customer, but sputtering comparable sales for the second year in a row have put a cap on stock gains. Costco does have a leg up that many other brick-and-mortar stores lack: membership fees. Costco charges its members a $55 annual fee for the privilege to shop at its warehouses. That cost acts as an incentive for customers to keep coming back as they try and earn back the fee through membership discounts. Costco's membership fees were up 4.4% during the last fiscal year as it continues to enjoy strong renewal rates and increasing "executive memberships," which cost double what a regular, "gold star" membership costs. In its Sept. 29 conference call, Costco said it notched a 90% renewal rate in the U.S. and Canada and 88% worldwide. The company reported a total of 47.6 million member households, up 1.5% from the previous quarter while executive membership jumped 2% quarter-over-quarter, bringing that number to 17.4 million. "Executive members now account for a little over one-third of our base and a little more than two-thirds of our sales, where executive membership -- executive members are offered," CFO Richard Galanti said during the conference call. For the extra $55 a year, executive members get discounts on other Costco services, such as the home and auto loan program and business services, as well as 2% a year cash back on purchases. The idea behind the push is that executive members will consolidate their purchasing at Costco, thus helping the comps sales figure. So far, though, it hasn't moved the needle past the negative impact from the gasoline and international business. Even with the recent 10% pullback, Costco's stock is too rich for me. The trailing-12-month price-to-earnings ratio is at 27.9, and the forward price-to-earnings based on the next fiscal year's estimates is at 22.6. A lower forward P/E than a trailing P/E implies investors are expecting profitability growth in the next year, but the high valuation numbers Costco totes are usually reserved for high-growth companies. Costco has a stable business that creates a strong incentive for customers to return. But with the company's growth rates slowing and a high valuation based on next year's profitability expectations, I think investors looking for a good value should look elsewhere.